RPT72 Yangtze Doodle is a scenario from the latest Rally Point pack – “Sons of the Rising Sun”. It presents a rather interesting layout between the Imperial Japanese Army (“IJA”) and the Chinese. The date’s Oct 5 1937. The IJA had crossed the Wusong Creek (also known as the Suzhou Creek). 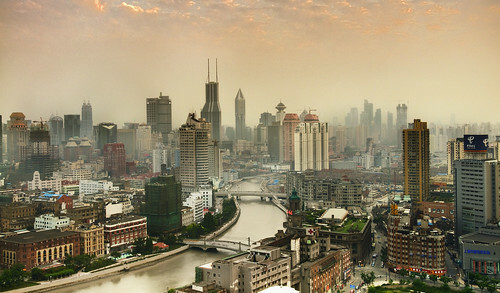 Wusong Creek is a river that cuts across Shanghai from the west to east which, in 1937, divided Shanghai up into the Japanese concession and the International Concession (Americans and British). Tangbeizhai was one of the Chinese garrisons that stood between IJA and a new line the IJA wanted to establish from the river crossing. North is to the left of the map. The Chinese squads in the little village in the middle were elements of the 3rd Battalion, 467th Regiment, 78th Division that were surrounded by the IJA. The Chinese squads on the far left were the 2nd Battalion sitting in reserve. The IJA would get reinforcements coming in from the far right. Chinese were 4-4-7s, IJA were 4-4-8s except for the two stacks you see on the right on the map. Both the Chinese and the IJA would have to fight in two directions. The IJA winning conditions were to control the bridge hex (which could be on the bridge or under the bridge, see A26.131) and to clear the village buildings in the middle of the map of any good order Chinese squads in 5 turns. This was a “face to face” game, with me being the IJA and a visiting friend “John Doe” who wants to remain anonymous. The IJA moved first and this was the end of the Chinese Turn 1. If you noticed the two hidden (“HIP”) IJA half squads deployed as speed bumps on the left of the map, you know I wasted an opportunity. The better use of HIP would have been to put the in the hamlet to the left of the stream and jump the Chinese while in concealment. Anyway, since the “hidden” IJA half squads were not in concealment terrain, they were spotted immediately and overran. The IJA LMG malfunctioned on the first shot (a common affliction for the IJA) but the IJA sniper broke a Chinese squad in the village to the right of the stream. This was the Chinese Turn 2. 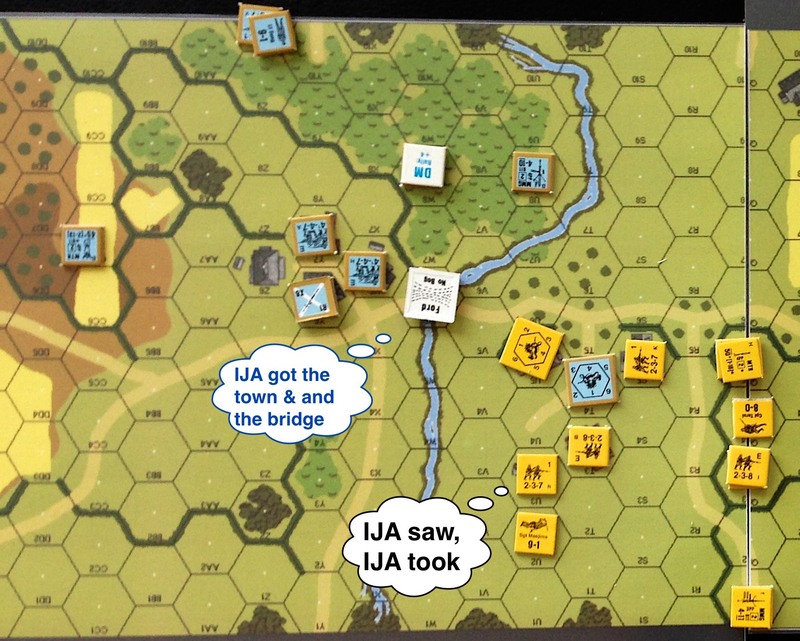 In the preceding IJA turn, an IJA half squad tried to move to the bridge hex but was broken on the way. The Chinese rushed head-on to the hamlet from the left. I made the mistake of leaving an IJA 9-1 leader by himself with the enemy in close proximity. While two out of the three incoming Chinese squads were pinned on the left, the Chinese 8-0 slipped through and swung around to the IJA leader. See that smoke counter? The IJA mortar smoked out the Chinese medium machine gun (“MMG”) and the Chinese hero dropped the gun and rushed in to kill the IJA leader from the right. The striped squad you see would eventually ran off and dived under the bridge. In the ensuring close combat, the IJA 9-0 was wounded and killed by the 8-0 and hero tag team. 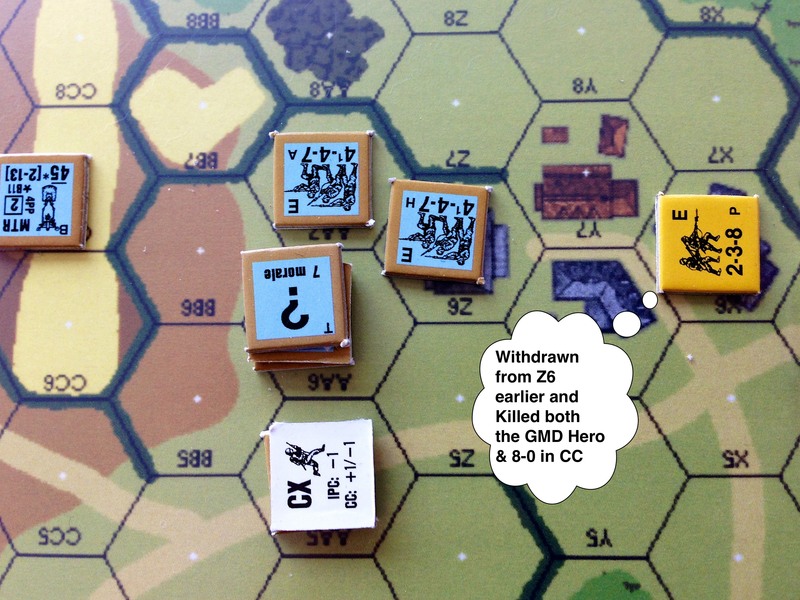 However the half squad under the malfunctioned LMG would withdraw from close combat (Chinese rolled boxcars) and killed the Chinese 8-0 and hero in hand-to-hand during the following IJA turn! This was the IJA Turn 4. The IJAs on the right had to break into the village before the Chinese on the left cross the bridge and link up with the surrounded garrison. Since the IJA sniper broke another Chinese squad in the village (he’s really earning his pay today), it’s time for a Banzai attack! Three IJA squads got reduced into 2 half squads (they do a great podcast by the way) but where they pointed, they reached. Hence in turn 4, the IJA sniper, a Banzai attack and a separate close combat took the Chinese garrison! 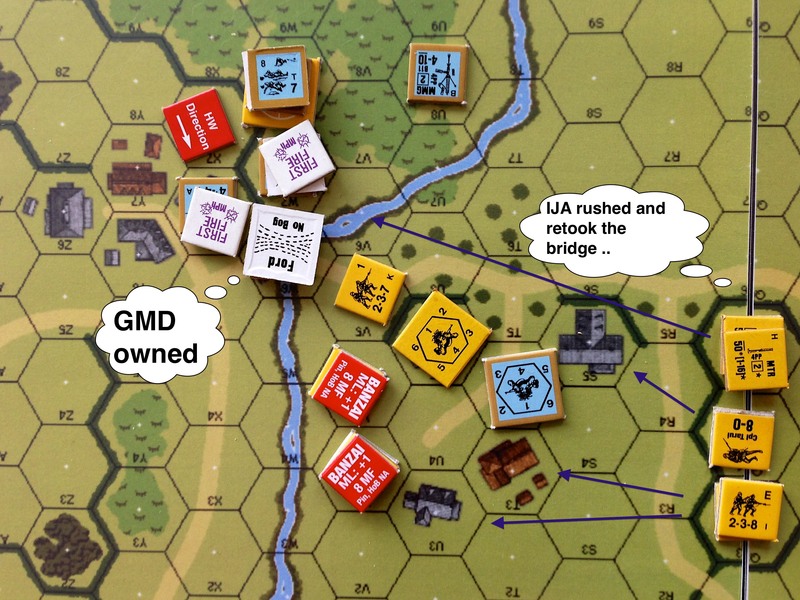 The Chinese to the left however, wiped out the avenging IJA and took the bridge hex. Hence in the last IJA turn, the situation called for another Banzai charge into the stream. All IJA personnel within running distance piled in. The other IJA squads and the MMG crew occupied key buildings in the village to prevent a Chinese counterattack in the last turn. So one striped squad and one half squad made it through the enemy fire and piled in on 2 Chinese squads. And do you know what I rolled? Two Chinese squads got wiped out in an automatic ambush. The bridge hex went back to IJA hands! In the last Chinese turn, a Chinese squad piled in after some ineffective preparatory fire. 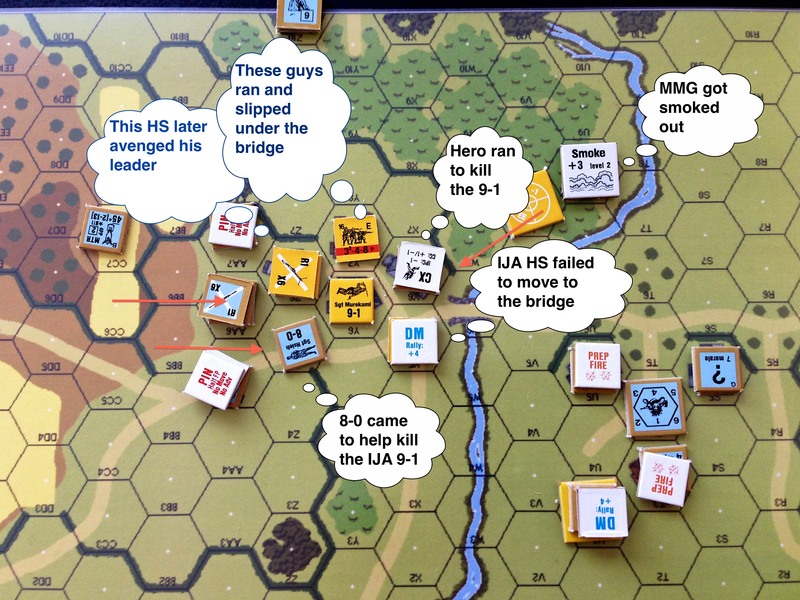 They had to kill all Japanese units in the bridge hex to retake it. So it all boiled down to the last Close Combat die roll. When the chatter in the dice tower died, the IJA won!! the IJA sniper played a key role in breaking two squads in choice locations today. as mentioned before, I wasted my HIP option via improper use. A better use would be to put them in the hamlet on the left of the stream and jump the incoming Chinese while concealed. I should have CX’d the IJA reinforcement coming in from the far right. 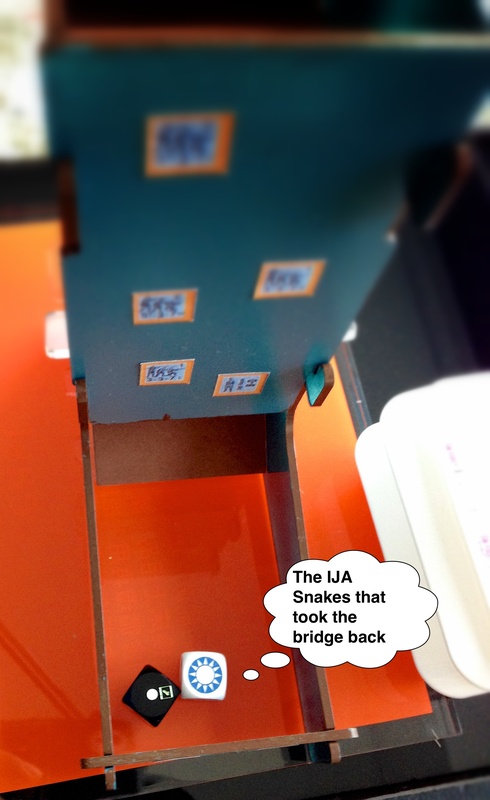 I was struggling to get enough IJA to rush the bridge at the end. Had the IJA reinforcement got on the scene earlier, I wouldn’t have this issue. 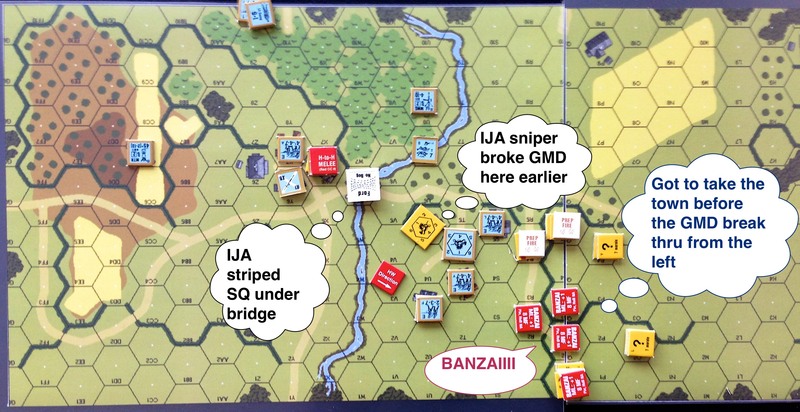 On the last IJA turn I could have run another Banzai attack on the other side of the village, making it two parallel Banzai attacks for the bridge. That would give me enough mileage to hit the bridge hex and a heightened morale level to do it with. However that could also open the village to counterattack. Any thoughts? Comments? Suggestions? Happy to hear from you as always!! 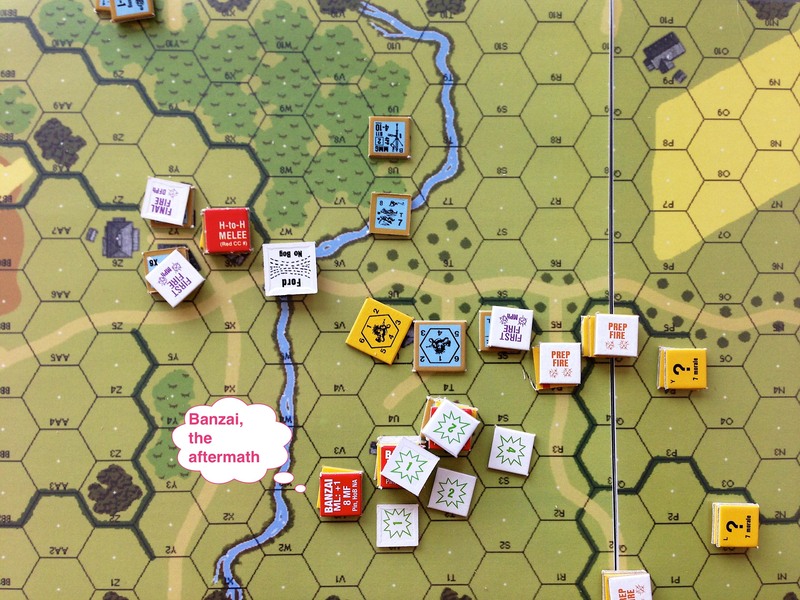 This entry was posted in Game Play and tagged AAR, Advanced Squad Leader, ASL, Board Game, board wargame, China, FtF, Hong Kong, Imperial Japanese Army, Shanghai, wargame. Bookmark the permalink. Shanghai is a great city, I really want to go back with empty suitcases so I can shop…a lot. Anyway nice AAR and a well timed snakes, enough to spoil anyone’s day. Thanks Ian .. my dice was seriously hot that day and hence absolutely no discredit to my opponent who incidentally taught me a TON as we played.